"Don't take this the wrong way, but isn't everything in this museum supposed to be dead?" If you grew up in or near New York, or even just visited, you know that the American Museum of Natural History is a wonderland, providing the stuff to fuel your imagination for years. That sense of wonder is at the very heart of Night at the Museum—the film's storytelling is occasionally a little ungainly, but it's a terrifically winning mixture of flights of fancy, state-of-the-art f/x shots, and deadpan Ben Stiller comedy, and if the kids in my house and my neighborhood are any indication, it's straight-up catnip for children. Stiller stars as Larry, a divorced dad who cannot hold down a job or even make rent, and is constantly being shown up by his ex's new husband, a smarmily successful stockbroker. Larry is a dreamer, but he's got a more immediate goal: he wants to hold on to the high esteem of his ten-year-old son, Nicky, who is beginning to tow the party line that his old man is a screwup. 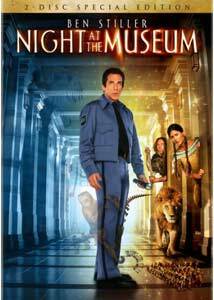 Larry essentially lucks into a job as the new night watchman at the museum, and that's where the fun begins. (If you've seen the trailer for the movie, you probably know the premise, but if you don't already know where this is going, you might want to stop reading this review and go check it out for yourself.) You've got to figure that the tough part of the graveyard shift in a museum filled with dioramas, fossils and taxidermy would simply be staying awake, but Larry soon finds that he's got a whole lot more on his hands: when the doors are locked and the lights go out, all the stuffed animals, dummies and statues come to life, creating pandemonium on Central Park West. And the inmates decide that they've got to put the new warden to the test, so Larry gets hazed in a big way: Dexter the capuchin monkey steals his keys and smacks him around; Attila the Hun wants to tear him limb from limb; pint-sized frontier folk want to tie him up, Gulliver style; and the lions simply want to eat him. Structurally, we get Larry on the hero's journey—how is a doofy single dad with no apparent skills supposed to manage a museum full of killers and carnivores and mischief? What's so winning about the film in many respects is due to Stiller—he eases up on some of the anxiety that's such a staple of his on-screen persona, but he's still very funny, and you can see, in a great early scene with his mother, that he comes by it rightfully. (Ann Meara works at the employment agency that places Larry at the museum.) And a lot of the comedy comes from the juxtaposition of Stiller some great effects shots�the enormous Tyrannosaurus Rex skeleton in the museum's lobby, for example, comes to life as an oversized, underfed prehistoric puppy, who only wants to play fetch. By the time you get into the second half of the movie, it doesn't lose its inventiveness, but you can still probably graph out all the plot points. Admittedly that doesn't make it any less satisfying, and it's the high-level effects wed to a tried-and-true story that make this work. (As director Shawn Levy points out on his commentary track, the emotional journey of father and son in this movie is not unlike the one you see in Finding Nemo.) Museums have already parlayed this into additional gift shop tchatchkes and even overnights—at last check, the wait list at the Museum of Natural History was huge—but another viewing of the film is likely to satisfy all concerned. Image Transfer Review: dOc was provided only with a screener copy for review, and the image quality on it tended to be a little blotchy. This may not necessarily be representative of the final release, so keep in mind that your mileage may vary. Audio Transfer Review: Audio quality on the disc sent for review was even more problematic—dialogue was frequently difficult to discern, and sync problems were numerous—but again, the appropriate grade for this would probably be an Incomplete, given that it's not the final version available for sale. Extras Review: This two-disc release overflows with extras—if you're not a fan of the movie, it's likely to feel like overkill, and there's no doubt that there are many redundancies, but there's a whole lot of information as well. Levy provides the first commentary track, and he's lively and chatty, discussing his history on the project, the perils of casting, and his partnership with Stiller. The biggest challenge seems to have been meshing Stiller's improvisatory sensibility with the carefully planned special effects; the actors did a lot of talking to walls or toothpicks standing in for shots getting worked out in the lab, and Levy himself seems to have made a very effective offscreen dinosaur. Screenwriters Robert Ben Garant and Thomas Lennon pair up on the second track, and they're jokey and self-effacing�too much so, maybe, but they're (no surprise) good on story and on the source material for the script (a children's book), and there's lots of chatter about New York locations�they discuss for the purposes of the movie grafting a wing of the Metropolitan Museum of Art, on the other side of Central Park, onto the Museum of Natural History. Also, they get points for their shout out to Final Draft. The rest of the extras are on the second disc, starting with a package (17m:06s) of eight deleted scenes, much of which provide backstory and setup for Larry, and a couple of which are alternate or extended versions of scenes in the final cut. (Levy provides optional commentary on these as well.) Bringing the Museum to Life (06m:20s) shows us the f/x crew at work, and dealing with Stiller's improvisational curveballs. Levy goofs his way through Directing 101 (04m:11s), and there's more of the same on the blooper reel (05m:48s), with lots of giggling and going up on lines. Monkey Business (05m:02s) focuses on Crystal the capuchin monkey; Patton Oswalt is your host for a Comedy Central behind-the-scenes piece (21m:12s), with lots of clips and on-set chatting. Levy shows off the set in Building the Museum (07m:29s) and Historical Threads: The Costumes of Night at the Museum (05m:11s) addresses the challenge of maintaining both historical accuracy and cinematic interest. The Director's Vision Comes Alive (10m:33s) is kind of a cheesy title for a comparison between the director's storyboards and the final cut; in Levy's illustrations, Larry looks less like Stiller, and more like Pugsley. Yet another making-of piece (11m:44s) offers some standard stuff; there's more meat in two pieces produced for the Fox Movie Channel. The first (10m:08s) focuses on a single scene, Larry's first encounter with Rexie the canine-like T. Rex; the second (25m:21s) is a Q&A with the director, interviewed by three students (from AFI, USC and Playhouse West), about Life After Film School. And if you've got a DVD-ROM drive on your PC, you can play a Reunite With Rexie game. The dramaturgy may be a little stodgy and clumsy, but there are enough eye-popping effects, fantastical images, whimsy and punch lines to make this one a great family favorite—director Shawn Levy maintains a delicate balance between kid-friendly fare and his leading man's more jaundiced sensibility. And it's as crammed with as many extras as you might hope for.